I’m sitting in a hotel in Waco, Texas, watching what has been advertised as tornado weather blow through. Virtually all flying at Waco Regional, including my appointment to fly the Blackhawk King Air 200, has been canceled for the day because of the threat of tornados. As I sit in my room, watching the Brazos River race by below and thunderstorms gallop past overhead, somehow only appropriate in Texas, I can’t help but marvel once again at the simple majesty of clouds. Victims of a tornado or thunderstorm may fail to see the beauty, but if you have the luxury of viewing nature’s whirlwinds from a safe distance, it’s almost impossible not to be impressed. As late afternoon morphs to evening and the sky darkens, I can begin to distinguish jagged explosions of lightning inside the jumbled overcast and an occasional cloud-to-ground strike illuminating the atmosphere to the west. The cumulonimbus slowly transition from white sheep to black sheep, both in color and personality. Night finally closes the curtains completely, and the sky is absorbed by a combination of dramatic, black mammatus interrupted by brilliant electrical discharges. The wind picks up to a howl, then dies away to nothing, then picks up again, as the storms work their way across Waco. Fortunately, we dodge the shotgun blasts of meteorological misery, though it doesn’t spare Fort Worth, 100 miles north. Still, I have to admire the sheer magnificence of the atmospherics, sometimes easier when you’re happily on the ground. The muscular cumulus dance in the milliseconds of light from the flashes, angry mountains of moisture piled high in the thick, humid Texas atmosphere. In this part of the world, the display often looks like the angry time-lapse sequences you see on the Weather Channel in the aftermath of storms. I’ve been a student of clouds for as long as I can remember. They’re the ultimate passengers of the wind, and I’ve been fortunate to study nature’s most dramatic meteorological manifestations all over the world. Growing up in Alaska was an excellent classroom for studying the banquet hall of clouds, and though we didn’t see many thunderstorms, it was the beginning of my continuing education in the ways of the visible sky. In flying the globe for the last 30 years, I’ve witnessed much of the architecture of air in motion, a comprehensive sampling of what the sky has to offer, from best to worst. I’ve seen the ever-present, bulging meadows of buoyant cumulus growing vertically across the South Pacific, from Hawaii to Guam to the Philippines to Singapore to Australia. I’ve witnessed lengthy lenticulars, wispy, pearl-shaped, iridescent sheets of ice crystals, stretching above the tallest peaks of the Andes, the Alps and the Sierras, gentle and benign in appearance, but portents of turbulence and updrafts. I’ve watched the formation of passive, shapeless fog, a velvet top sheet of stratus sleeping on the Earth, slowly drifting in along the California coast, the Namib Desert or the beaches of Western Australia. I’ve monitored the birth of wispy, mare’s tail cirrus, floating high up on the four-mile-tall Chilean Andes, the world’s second-highest mountain range. Clouds provide dimension and personality to a sky that might otherwise be pedestrian. Like most pilots, I’m granted a perspective unknown to underprivileged, ground-bound mortals. I experience God’s handiwork in three dimensions rather than only two. I can look down as well as up at the clouds. I’m even allowed to fly through them, an ultimate privilege granted to those with a need to know the why and the how, as well as the look of clouds. For those pilots who have been fortunate to visit clouds for years and have become almost immune to their magnificence, imagine for a moment having been born blind and suddenly being granted the gift of sight to witness a fully mature Rocky Mountain thunderstorm anvil 50,000 feet high, black clouds and lightning in full bloom, 50-knot winds singing accompaniment to the storm. The experience probably would be somewhere between terrifying and magnificent. Those without the benefit of the high station color all clouds white, when, in fact, they can shade from brilliant white through all tints of gray to black and even beige and brown. Thunderstorms present perhaps the widest palette. They’ll often showcase the blackest developments you could imagine, sometimes tinged with blue-white splashes of lightning. Clouds also can prescribe shapes and present optical illusions that you wouldn’t believe. Out on the ocean, there’s not always a lot to do, and we’ll sometimes stare at clouds, trying to imagine what they resemble. Once, over Iqaluit, Nunavut, Canada, just south of the Arctic Circle, I looked down on a 50-mile-wide field of symmetrical, puffy, tapering cumulus, round and fat in the middle, small on top and bottom, resembling for all the world the Michelin Man or the Pillsbury Doughboy. Of course, that was the trip when I left my camera at home. Fly in and around clouds for 10, 20, 30, 40 years, and the perceived illusions can become pervasive. Drive through smooth, heavy fog for several hours, and you can become convinced you’re not moving. Never mind what the GPS suggests. Other times, things seem to happen all too quickly. Once, 20 years ago, I was delivering a 58 Baron from Palo Alto, California, to Cleveland, Ohio, after a double engine change, flying through magnificent canyons of cumulus in late afternoon. I was scudding in and out of the weather, 11,000 feet above Illinois, when I popped out of a puffy and suddenly knew I was dead. Another airplane had just emerged from the wall of white straight ahead and was coming right at me, obviously flying at the wrong altitude. It happened so fast, I knew there was no chance to avoid a mid-air. I had only the briefest millisecond to brace for impact and wonder who’d feed my dogs. I collided with my own shadow, projected on the cloud ahead by the sun behind, shining through a gap in the canyons. Mother Nature – 1, Bill – 0. Unlike that experience above Illinois, most of my flights in the clouds don’t leave me with a pounding heart, a lump in my throat or a wet spot on the seat. If George is flying, and I’m not working too hard during IFR flight just to stay where I’m supposed to be, I’m often examining the inside of my little world, watching rivulets of moisture condense on the windshield, monitoring the vortexes of water vapor streaming off the props or wingtips and trying to guess the visibility. 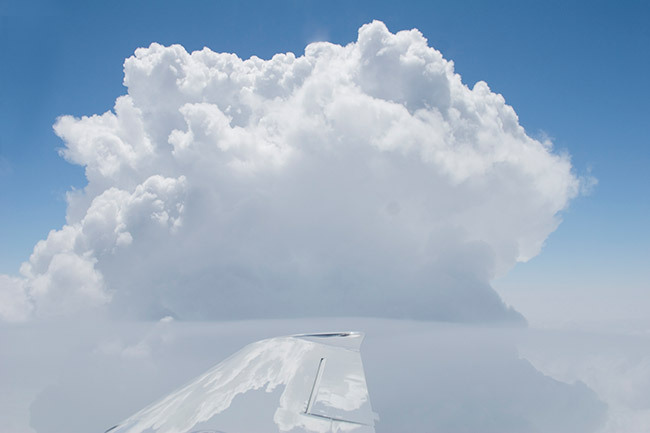 The inside of a cloud isn’t as opaque as you might imagine. I once flew a new Partenavia P68C from Naples, Italy, to Santa Paula, California, and on the Reykjavík/Goose Bay leg, I flew formation on another P68 for 12 hours. Contrary to popular belief, you’ll sometimes have 50 yards or more visibility inside a stratus. Even when conditions are less clement, there’s nearly always at least 20 yards of view. For me, clouds are a preoccupation, and I’ll forever be an apprentice to their mystery and majesty. They’re God’s finest sculptures above Earth.